June 19, 2017 — United Pet Group, a division of Spectrum Brands, Inc., is voluntarily expanding its recall of multiple rawhide dog chew products to include private label brands. The recall was initiated due to possible chemical contamination and includes the affected brands and products below. United Pet Group previously initiated a voluntary recall of its branded products on 6/10/17. Click here for the original June 10, 2017 recall article published by The Dog Food Advisor. The recall was initiated after United Pet Group identified that certain of its rawhide chew manufacturing facilities located in Mexico and Colombia, as well as one of its suppliers in Brazil, were using a quaternary ammonium compound mixture as a processing aid in the manufacturing of rawhide chews. Exposure to quaternary ammonium compounds through direct ingestion may cause the following symptoms in dogs: reduced appetite and gastric irritation, including diarrhea and vomiting. We take our responsibility to pets and their owners seriously and we are continuing to investigate the cause of this problem. We are implementing changes across the affected manufacturing facilities in order to prevent this problem from reoccurring in the future. United Pet Group is also working with retailers to ensure that the affected products are no longer sold and removed from inventory. The affected product was distributed nationwide from United Pet Group’s Edwardsville, Illinois distribution facility and was delivered to consumers through various retail establishments, including online outlets. All of the dog chew products included in the voluntary recall include an expiration date ranging from 06/01/2019 through 5/31/2020. 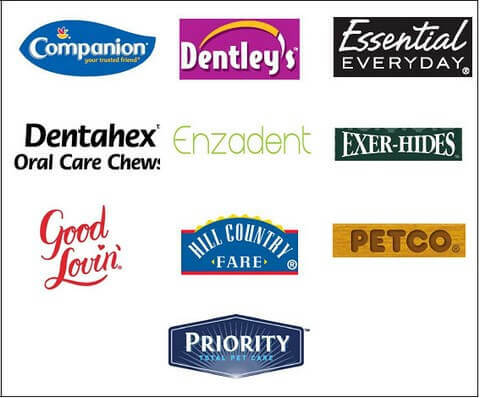 The expiration date can be located on the back of the package with the exception of the Enzadent and Dentahex products which are listed by UPC codes and specific expiration dates outlined below.